I have been a physicist working for CMS for about ten years now, and a guitarist for about twice as long. From time to time I have tried to somehow marry these two worlds, and when I became interested in guitar building I realised that I need to build a “CMS guitar”. 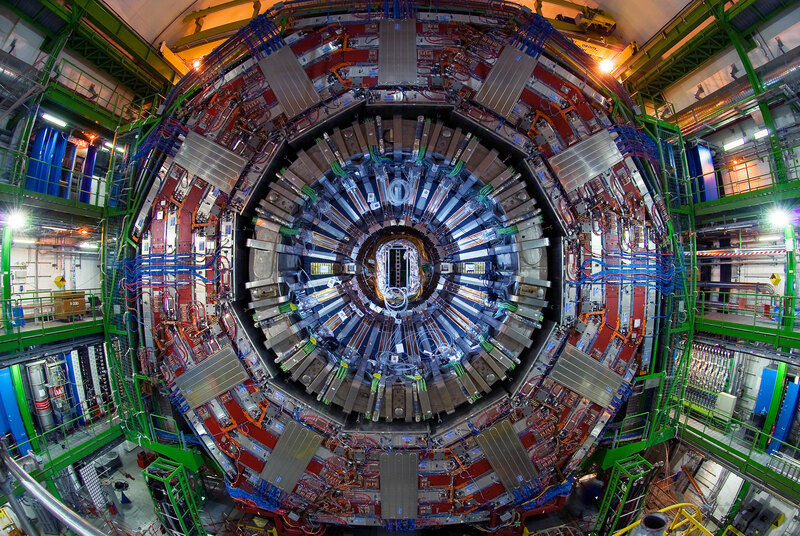 A one-of-a-kind instrument that — like the CMS detector — would be a prototype of itself, and a way of showing CMS to people who otherwise might never have heard of it. To me, it would be a way of celebrating the experiment and showing how proud I am to be part of it. Also, I thought it would be really cool. CMS has great visual appeal so I thought the head-on view would be great as the artwork for the guitar body. To make it even more unique I decided to order a jigsaw puzzle with that photograph and attach it piece by piece to the guitar. I also wanted to make a guitar without frets. At least without most frets — I decided to keep the first five frets in, to make playing the standard guitar chords possible for someone who never played fretless before (i.e. myself). I figured that the best approach for someone with no real experience in guitar building would be to find a suitable instrument to use as a baseline and modify it according to the ideas that I had. I started a blog at http://cmsguitar.blogspot.com and described the whole process there: design decisions, tests and my attempts to learn the different skills and tricks needed along the way — like removing a fretboard from a guitar using a clothes iron and a steak knife. In mid-July 2012 I finished the construction, just in time to have the world premiere of the guitar at the annual CERN Hardronic Festival, during my performance with my band, Miss Proper and the Moving Targets. I am now trying to master playing the fretless part of the guitar, with the aim of writing and releasing some original music performed on this instrument. And I will of course be using it during live shows with my band. I'm keeping the blog up to date with what's happening.